← Happy St. Patrick’s Day To My Wee Coupongy Correspondents! Detailed view of Edith’s wedding dress. 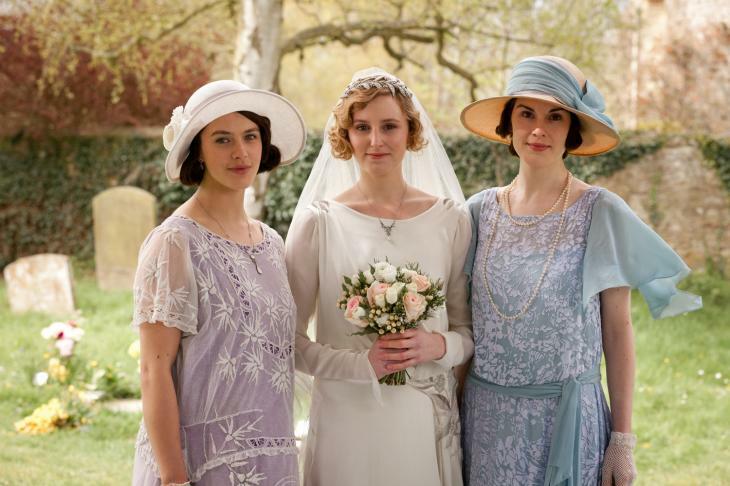 Costumes of Downton Abbey is an original exhibition of exquisite designs from the award-winning television series. Forty historically inspired costumes from the television show will be displayed and supplemented by photographs and vignettes inspired by the fictional program and by real life at Winterthur. Visitors will have a chance to step into and experience the world of Downton Abbey® and the contrasting world of Winterthur founder Henry Francis du Pont and his contemporaries in the first half of the 20th century. A co-production of Carnival Films and Masterpiece, Downton Abbey depicts life in an aristocratic household of the fictional Earl and Countess of Grantham and is one of the most popular and critically acclaimed period dramas ever produced. It has won a Golden Globe Award for Best Miniseries and seven Emmys including a Primetime Emmy Award for Outstanding Miniseries. It was the most watched television series in both the UK and the U.S. and became the most successful British costume drama series since the 1981 television serial Brideshead Revisited. By the third series, it had become one of the most widely watched television shows in the world. The Guinness World Records recognized Downton Abbey as the most critically acclaimed English-language television series of 2011. Detailed view of Mary’s engagement dress. The costumes will be lent by Cosprop, the world’s leading costumier to film, television, and theater. Winterthur’s most popular exhibition, Fashion in Film, which attracted more than 42,000 people over its three-month run, also featured costumes by Cosprop. *Timed tickets are required for this exhibition. To reserve tickets to the exhibition, please call 800.448.3883. Nonmembers may also purchase tickets online by clicking here. Included with general admission. Members free. To complement the exhibition, Winterthur will host a wide range of lectures and several English brunches and teas. For more information on visiting Winterthur during Costumes of Downton Abbey, including tips for enhancing your visit and Members-only access and information, click here. Winterthur Gardens is located 5105 Kennett Pike (Route 52), Winterthur, DE 19735.